The Cumberland & Dumfriesshire Farmers Mart P.L.C. held their Annual Show & Sale of 2,084 head of Hoggs with Lambs, together with other sheep at Longtown on Tuesday 18th May 2010. 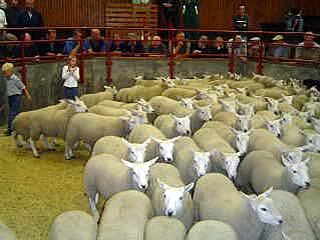 Mule Hoggs with Singles – 1st – Messrs Ridsdale, Yew Tree, Calthwaite and sold at £89. 2nd – Messrs Ridsdale, Yew Tree and sold at £86. 3rd – P.M. Kidd, Briggle Farm, Langwathby and sold at £77. Continental Hoggs with Singles – 1st – T. Davidson, Bellmount, Irthington and sold at £67. 2nd – D. Carr, High Wood, Hexham and sold at £69. In general all sheep were to sell at more money and short of requirements from a full ring of buyers. Hoggs with singles:- Greyface £89, £86, £82 Yewtree, £79 Mossband Hall, £78 Briggle, £77 Seat Hill, £73 Prospect; Cheviot Mule £70 Highwood. Hoggs with twins:- Suffolk cross £68 Seat Hill; Greyface £66 Little Blencowe. Shearlings with singles:- Beltex £79 Bensons Fell; Texel £60 Fergus Hill; Cheviot Mule £58 High Chesters. Shearlings with twins:- Texel £58.50 Fergus Hill; Greyface £55 Henrys Hill. Ewes with singles:- Beltex £77 Bensons Fell; Texel £66.50 Flex; Cheviot Mule £64 High Chesters; Cheviot £55 Hardhurst; Suffolk cross £55 Hardhurst; Lleyn £52.50 High Dovecote. Ewes with twins:- Beltex £63 Bensons Fell; Suffolk cross £58 Waynrigg; Texel £53.50 Flex; Zwartbles £53 Mossband Hall; Greyface £53 Henrys Hill and Moss Side; Lleyn £51.50 High Dovecote; Swaledale £36 East Cragside. Geld hoggs:- £89 Reagill Grange. Store hoggs:- £80.20 West Wharmley. Cast Ewes:- £85.50 Brookfield, who also sold hill types at £69.50.